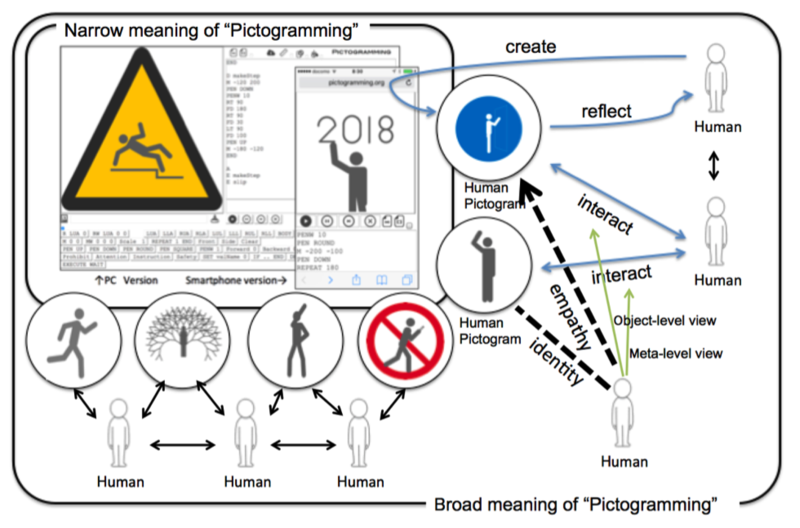 Pictogramming is based on two words: “pictogram” and “programming.” The basis of this application is the use of a human-shaped pictogram (i.e., a “human pictogram”). Pictograms resemble a person or object with an abstract representation. Human pictograms are associated with syntonic learning and visual manifestation. Application “Pictogramming” is a new learning environment for programming and also is a new authoring environment of human pictograms. The proposed application can display a human pictogram in the front and side directions defined by ISO, where both comprise nine body parts. 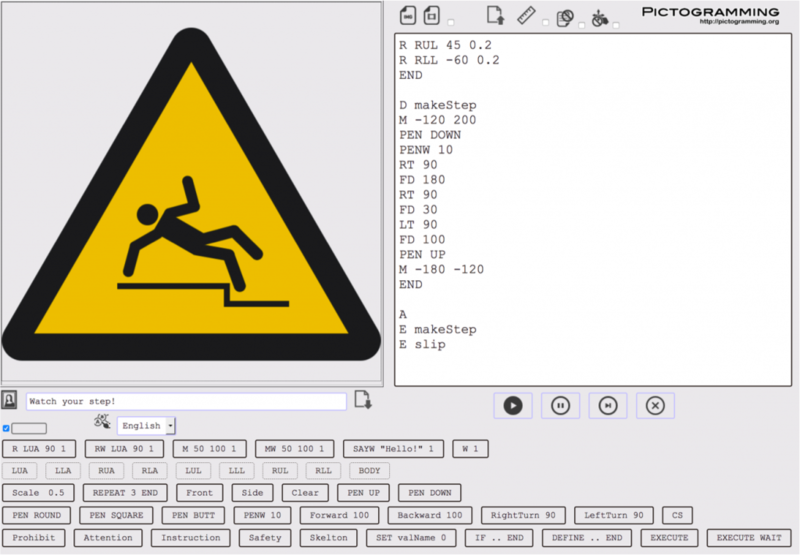 The application moves the parts using a command sequence called the “Pictogram Animation Command.” The application can draw the movement history (similar to turtle graphics) as “Pictogram graphics.” The combination of both functions facilitates learning in small steps over a short period of time using a small command set. Body syntonic learning: Strongly associated with the senses of children and knowledge of their bodies. Ego syntonic learning: Consistent with the self-consciousness of children as humans with intention, purpose, desires, likes, and dislikes. Cultural syntonic learning: Linked to personal activities that are firmly and positively rooted in one’s culture. The human pictogram resembles a body that represents the ego and the illustrated pictograms represent one’s culture. Thus, the human pictogram conforms to these three types of syntonic learning. Figure shows works that were all created by the application. Figure (A)–(B) shows typical human movement, created mainly based on body syntonic learning. Figure (C)–(D) represents artistic, humor, some major person’s famous action, and so on. These pictograms are difficult to categorize, but all are based on ego syntonic. Figure (E)–(F) shows the pictograms linked to personal activities based on rules, morals, and culture, and some of these are widely used in one’s culture. Of course, these types of syntonic learning cannot be separated clearly, but these works are based on a combination of various kinds of syntonic learning. Now, we consider a mass classroom. Figure (A) represents a typical relationship between members of the classroom. The teacher instructs the students unilaterally. The human pictogram is introduced and the student starts to command or operate it (Figure (B)), and then begins to communicate with one’s human pictogram (Figure (C)). Figure (D) is a scene in a classroom using the Pictogramming application. One student talks to another student about his/her pictograms and mimics the movement. As the pictogram is highly visible, the student happens to see the pictograms in the monitors naturally and acts with them. This means that one student communicates with other students’ human pictograms (Figure (E)), and communicates with other students on human pictograms (Figure (F)). The students program and create numerous works via this process using the philosophy of constructionism. A cognitive science researcher Norman mentioned that the cognition could be classified into two types. One is experiential cognition, which is data-driven information processing with reactivation of information patterns in human memory. The other one is reflective cognition, which is concept-driven processing in deep reasoning such as decision-making and planning. Okamoto associated a duplex viewpoint with these two types of cognitive processes [Okamoto 2005]. Figure shows an image of a duplex viewpoint realized by a human pictogram. One is an “object-level view,” and the other is a “meta-level view.” These two viewpoints are tightly linked through the self-identification of “ego” (reflective subject) and “self” (experiential subject). In observing the interaction of others from a distance, such duality is generally not established. However, if the observer can emphasize his viewpoint with one participant in the interaction, he can also acquire the virtual object-level view so that one can experience the interaction as if it were one’s own. This duplex viewpoint via empathy shows how first-person engagement can be achieved. [Okamoto 2005] Okamoto, M., Nakano, Y. I. and Nishida, T. (2005) Toward enhancing user involvement via empathy channel in human-computer interface design. Bold. L., et al. (Edo. ), Lecture Notes in Computer Science Vol. 3490, Intelligent Media Technology for Communicative Intelligence, p. 111-121, Springer.